To start using the software simply double click on the Boomerang List Builder.exe file. Your Boomerang List Builder wizard will then open, the first step is to select the file that you wish to lock, use the Browse button to locate the product you wish to lock, once you have selected the product click on the “Next” button. Step two is to give your locked product a name, this is self explanatory and can be anything you wish. When you have entered an appropriate name, click on the “Next” button. The next step is a little more complicated, not because it's difficult but it does give you 3 different options to choose from! These options are Free Trial, Immediate Registration or Registration After. You can find out more about the different options by clicking on the "Lock Type" heading in the Navigation window. When you have chosen your “lock type” and have entered the information click on the “Next” button to continue. 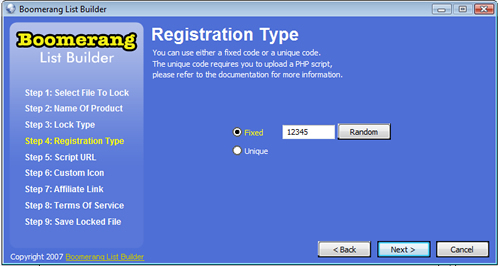 Step four is to choose the registration type. You have 2 choices fixed or unique. You can get more information on the code types by clicking on the "Code Types" link on the navigation window. To use a fixed code simply enter the registration code in the box provided, if you want the software to generate a random code then click the “Random” button. If you would like to use the unique code then all you need to do for now is select the “Unique Code” radio button and then enter the length of the code that will be generated. Remember the length of the code, you will need this later. Once you have made your choice click on the “next” button. 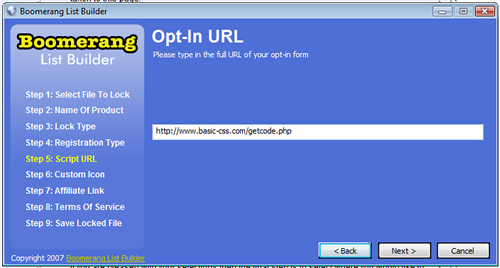 The next step is to enter your opt-in URL. This will be the URL of the opt-in page that will be used to collect the users name and email address - more info is available in the "Opt-In Pages" section of this manual. When the user clicks on the “Get Registration Code” button they will be taken to this page. Enter the URL in the box and click on the next button. 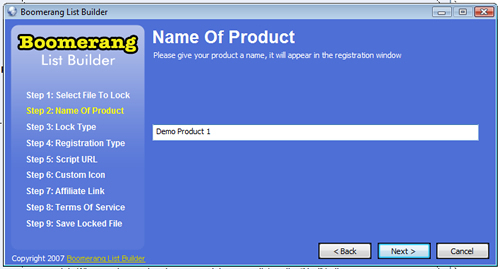 Step 6 is optional and allows you to add a custom icon that will be displayed for your product. You can choose any icon (a .ico file) from your PC using the browse button, if you don't want to use a custom icon then simply leave the field blank and click on “next”. * Please note: The custom file option will not work if you lock the file using a Vista PC. Our research has shown that this behaviour on Vista is normal because ordinary users are not allowed to modify executable files. This is a security issue with Vista and unfortunately there is no workaround for this at present. Step 7 is one of my favourite features, this allows you to earn commissions on auto-pilot by embedding your Boomerang List Builder affiliate link in the software. 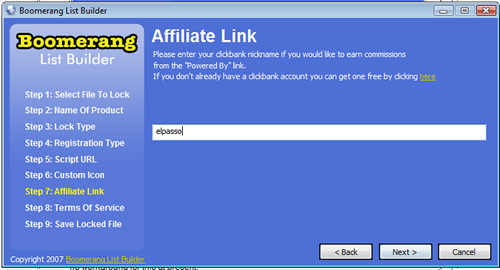 Simply enter your affiliate ID (don't have one? - click here) in the box and click the “next” button to continue. If you would prefer not to earn a commission then leave the box empty. The final section of the wizard asks you if you would like to enter some terms of service (TOS) for your product. If you enter any TOS into this box the user will be forced to accept them before they can use your product. If you would prefer not to include a TOS then simply leave this field blank and click on “next”. The final screen simply gives you an overview of all the information you have entered into the software. If you wish to change anything then simply click on the “back” button. If you are pleased with your selections then the final step is to select where you would like to save the product. Click on the “Browse” button and choose where you would like to save the file. Once done click on “Next” for the last time and your product is ready to go!